Climbed on April 5, 2008. 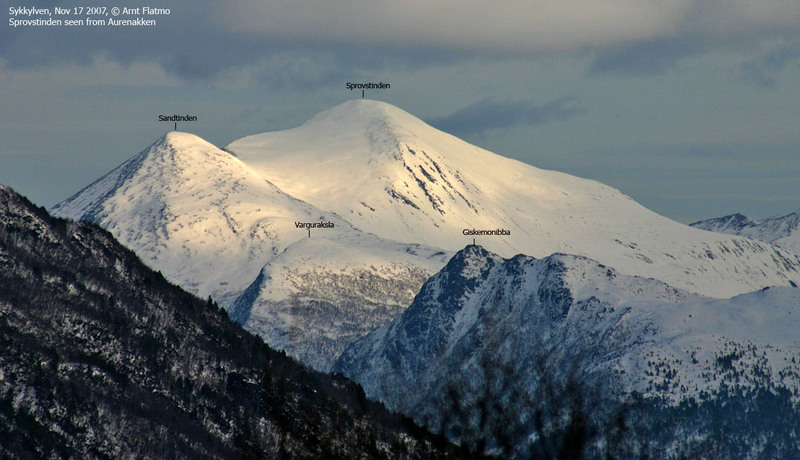 How to get there: From Ålesund, drive E-39/E-136 towards Åndalsnes. You pass the place Sjøholt then the road climbs gently up on Ørskogfjellet. On top, you first pass the general skiing area with parking on your right, then note a small sign pointing right saying "Skitrekk" (Downhill slope). Turn right here. This road is often closed, but there is often parking here right off the general highway. The distance from Ålesund is slightly more than 40 kilometer. This is the trailhead, park here, location N62:32.450, E006:57.559, elevation 294 meter. Route description: Ski up the downhill slope towards the top of the highest (leftmost) ski lift. Before getting all the way there, ascend towards your right and contour the steeper terrain that lies above the ski lift. From there, continue uphill to the summit of Sandtinden, 1065 meter, location N62:32.663, E006:59.995. From Sandtinden, continue along the connecting (broad) ridge across towards Sprovstinden. Stay away from the steep side on your left (cornices in winter). The remaining slope is quite gentle to the flat summit of Sprovstinden. Also, see the more comprehensive information by Arnt Flatmo. Comments: I had arrived in Ålesund the evening before, picked up by my friend Arnt and treated to a warm welcome. The weatherforecast for Saturday was not great, while the weather was supposed to improve on Sunday. Since Arnt had climbed Sprovstinden just last week and also skied it the normal way, we decided that I should make a (solo) attempt on Saturday. I started from the road around 0940 (the access road to the ski area was closed and snowed in). The weather was cloudy, variable wind and about 10 cm of new snow. As I started skiing up the downhill slope, I noticed that the skins started to accumulate snow, always somewhat unpleasant. At the top of the ski slope, I continued somewhat right and into the clouds. Higher up, I had a short stretch with slightly steeper terrain and also somewhat icy. To make things even more unpleasant, the wind picked up and had some gale strength gusts. I stopped and considered the situation. My conclusion was that a short break in order to see if the weather would deteriorate or stabilize seemed wise. The wind did indeed subside and I continued uphill, getting to the top of the subsidiary peak, Sandtinden 1065 meter, at 1130. This peak has prominence 55 meter, being connected to Sprovstinden by a broad saddle. The visibility was close to zero, but I did see the left cornice as I skied across the saddle. As always in dense fog, this cornice looked really bad and I kept a respectful distance. The remaining stretch to the summit of Sprovstinden was easy as I skied straight uphill using my GPS. 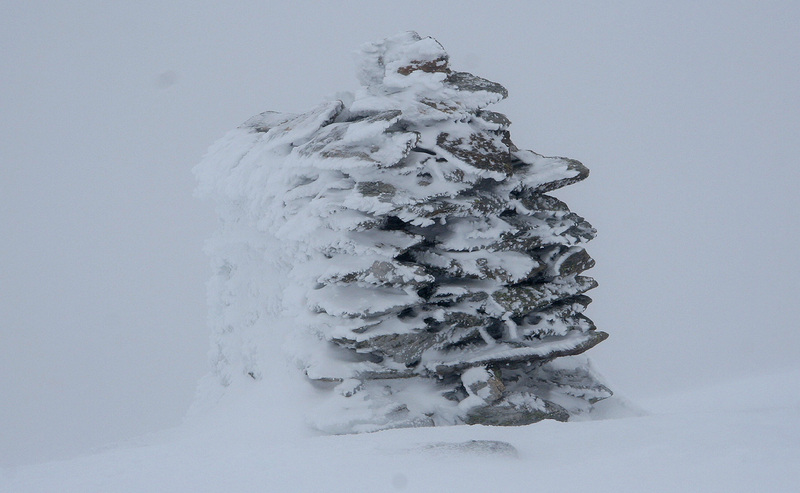 I arrived on top at 12 noon, another dangerous cornice was barely visible otherwise a lot of snow. My GPS showed 1299, corresponding to about 4 meter of snow, I guess the summit may still hold about 2 meter. The return ski was quite uneventful, I called Arnt from the summit of Sandtinden, then had my lunch. Skiing down, I reached the car at 1340, 4 hours after starting out. Sprovstinden, the route comes up the valley behind Varguraksla (from the left), ascends Sandtinden, then connects to Sprovstinden.